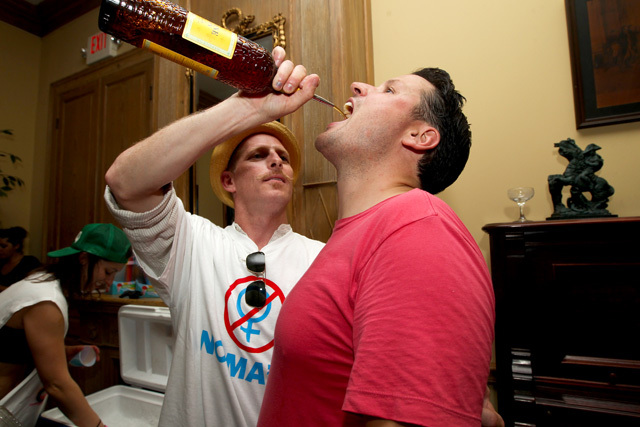 It was the first day of Tales of the Cocktail 2013, and an epic battle was being waged at the Napoleon House in the heart of the French Quarter. According to lore, the Napoleon House was built in 1797 for Napoleon Bonaparte as his residence during exile. On this sweltering July afternoon, the second floor of the Napoleon House was the site of the inaugural Mandarine Napoléon Imperial Battle of the Sexes. Originally created for Napoleon by his physician, Antoine-François de Fourcroy, Mandarine Napoléon was introduced to the public in 1892, after their deaths. The orange liqueur — a blend of mandarins and 10-year aged cognac — was re-launched in the U.S. in 2011. As its name implies, the Imperial Battle of the Sexes pitted men against women. 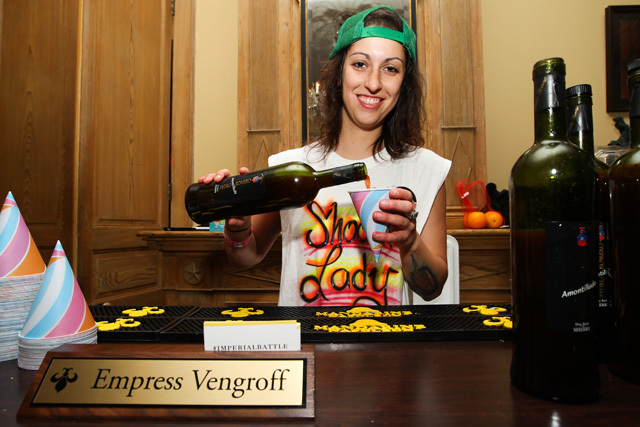 Eight of the top bartenders in the country were paired off at four stations. Each bartender was asked to create a cocktail that featured Mandarine Napoléon. Guests were handed ballots, sampled the cocktails, and voted for their favorite of each pair. They could also wear a button to support their favorite Emperor or Empress. As soon as guests entered the “battlefield,” they came upon Naomi Schimek (The Spare Room) and John Lermayer of The Regent Cocktail Club at the Gale in South Beach. Schimek’s If I Can’t Dance To It, It’s Not My Revolution was a labor-intensive, neo-tiki drink that made an immediate impression on the crowd. 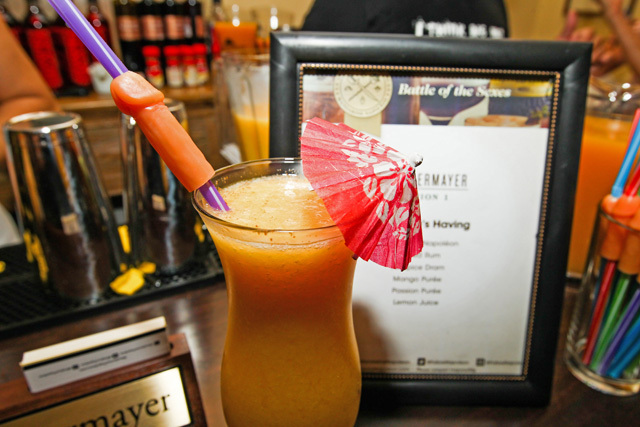 Lermayer, who will be at The Spare Room on Sept. 4, put his blender to work and served What She’s Having with a NSFW straw. “What She’s Having” by John Lermayer: Mandarine Napoléon, Spiced Rum, All Spice Dram, Mango Purée, Passion Purée, Lemon Juice, Grated Cinnamon. “Cinémathèque Luau Punch” by Lynnette Marrero: Mandarine Napoléon, Fresh Pineapple Juice, Fresh Orange Juice, Lemon, Lime. Next up, two bartenders that represented the vanguard and an earlier generation of New York craft cocktail bars, respectively: Shel Bourdon of The Dead Rabbit, and Jeff Bell of PDT. 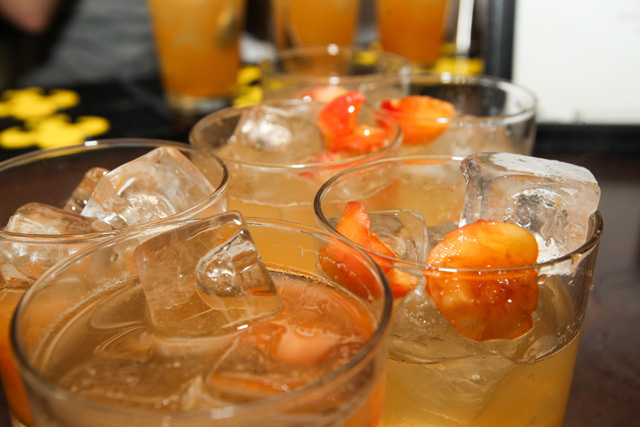 “Aperitivo Napoléon” by Shel Bourdon: Mandarine Napoléon, Vermouth, Tequila, Rainier Cherries, Mezcal. 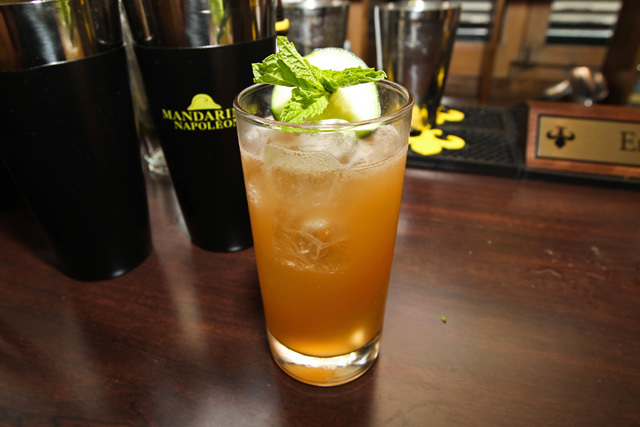 “Mandarine Maid” by Jeff Bell: Mandarine Napoléon, Lime Juice, Cucumber, Mint Leaves, Angostura Bitters, Club Soda. At the final station, Yael Vengroff (Harvard & Stone) had already won by default, because her opponent was unable to compete. Vengroff had hoped to face off against her male counterpart, but no matter who answered the bell they would’ve had a tough time beating her Amandarin Bynes, an outstanding snow cone that had guests clamoring for more. In his role as pinch-hitter, EO’s Dev Johnson poured Mandarine Napoléon laybacks that went down nicely. 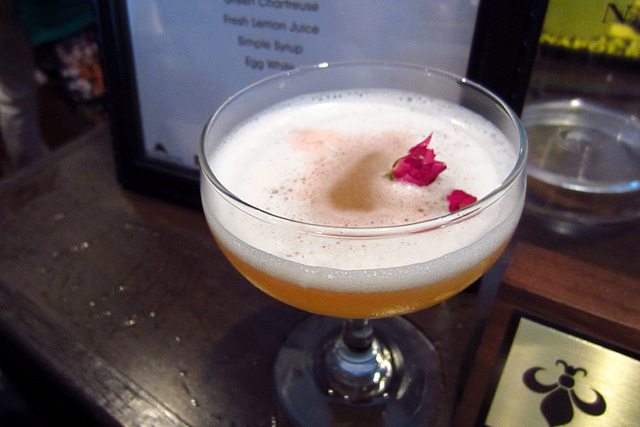 “Amandarin Bynes” by Yael Vengroff: Mandarine Napoléon, Dry Sherry, Rum, Lemon, Fresh Strawberry, Orange Slice. Antoine-François de Fourcroy would have approved. Unfortunately for the men, the Napoleon House would be their Waterloo. 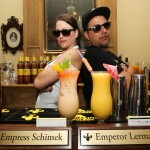 After the votes were tallied and the dust had settled, the women emerged victorious, and Naomi Schimek’s cocktail was named Best in Show. 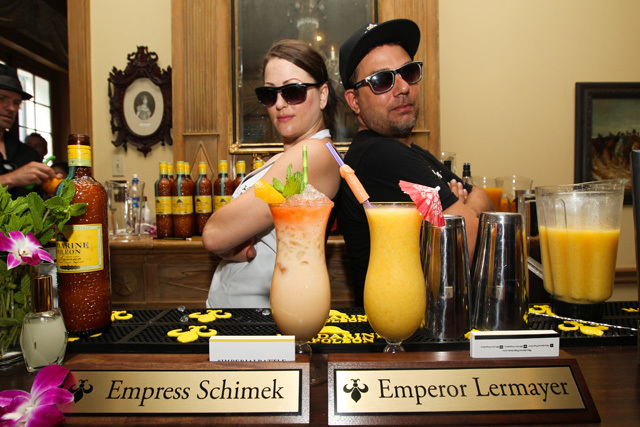 With around 200 attendees, the Mandarine Napoléon Imperial Battle of the Sexes was an intimate event compared to some of the massive parties that took place later in the week. It struck the right balance for a first-day Tales event — fun, lively but not crazy packed, and great cocktails by some of the best in the business. 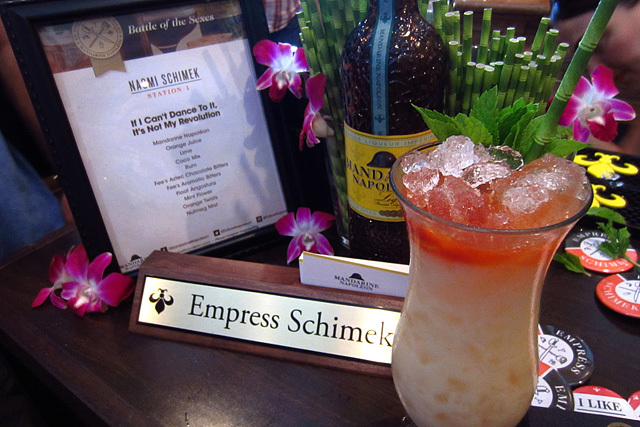 Cheers to Naomi Schimek and her fellow Empresses! 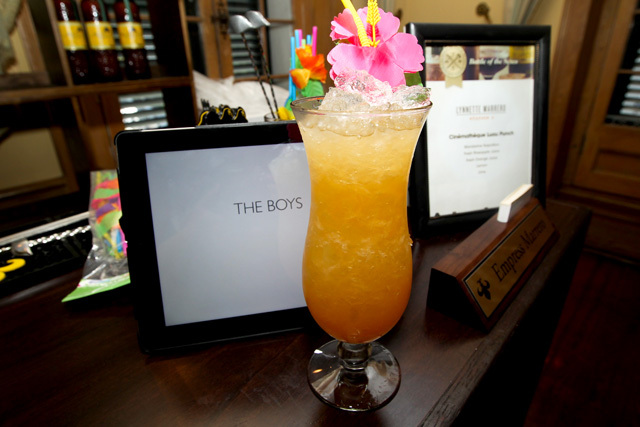 For more photos of Tales of the Cocktail 2013, visit the Thirsty in LA Facebook page.